The Series 1957 Baby Blades. Back in March I had the distinct pleasure of meeting master custom club fitter David Butler at his shop in Half Moon Bay, California, and posting a piece about the fascinating fitting experience for The A Position. Known as Doctor Grip, the Ohio-born Butler was once the chief engineer for Chrysler Corporation and has been assembling clubs his entire adult life. Now 73, he works exclusively with heads forged by Japan’s Katsuhiro Miura and his two sons, who are quietly attaining legendary status in the golf world for the unsurpassed quality and creative designs of their clubs. During a session that lasted more than four hours, I hammered 6-irons with the full variety of Miura irons, from their new Passing Point model to the basic Tournament Blade. I also hit with a series of shafts with different stiffness and flex points. Just about the time my arms were about to fall off, Butler finally had enough data from his TrackMan. The clubs that would serve me best – – that is, providing the maximum distance yet with the optimal trajectory to hit and stop on a green, and the tightest downrange dispersal pattern – – would have ultra-light stiff-flex True Temper M-80 shafts about a half-inch longer than standard. Butler also recommended a mid-sized Iomic grip with an extra layer of wrapping under my left hand. 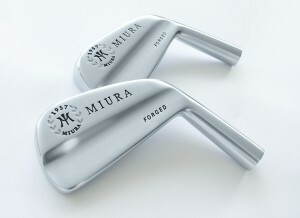 And to my surprise, he said Miura’s limited edition Series 1957 forged blades performed best for my particular swing. Well, he was right. I’ve now had these clubs for three weeks and after putting in a few rounds with what are also known as Baby Blades, I’m making crisper contact on the ball far more often than normal, have hit my 110-yard club 130 yards – – which means I’ve got to start making adjustments – – and have found the Miura wedges the most deadly accurate sticks in the bag. In fact, the on-course performance of these clubs confirms what Katsuhiro Miura said when he introduced the Series 1957 in 2009. “I have a special pride in this club,” he explained, “because it’s so easy to hit.” To Miura’s way of thinking, the smaller size actually makes it easier to square up the face at impact. Moreover the corners near the heel and toe are ground upward slightly, which allows the head to more easily cut through the turf. What’s more, while the forgings are soft, the face of the Series 1957 is denser than any other Miura iron, which puts punch into the impact and sends the ball on an aggressively angled flight. Indeed, a set of brand-name off-the-shelf irons verses a perfectly balanced Miura carefully assembled by a fitter like David Butler is like the difference between an upright honky-tonk piano and a full-sized Steinway. There is a touch and feedback that one simply doesn’t get from most other clubs, and given the mild and soft steel it’s not painful like a mishit with a baseball bat. My colleague David Gould, who plays Miura Passing Point 9003 irons, goes downright poetic over his clubs, which were assembled by Frank Viola, a Boston-area master fitter. Like others who use Miura, he sees each club as a work of art. 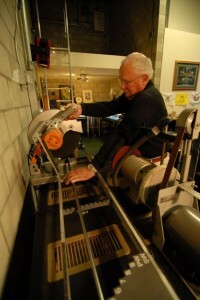 David Butler at work in his assembly shop. manufacturers are molten, impurities rise up to the top, but are usually just folded back into what turns into a bar that’s used for heads,” explains Butler. 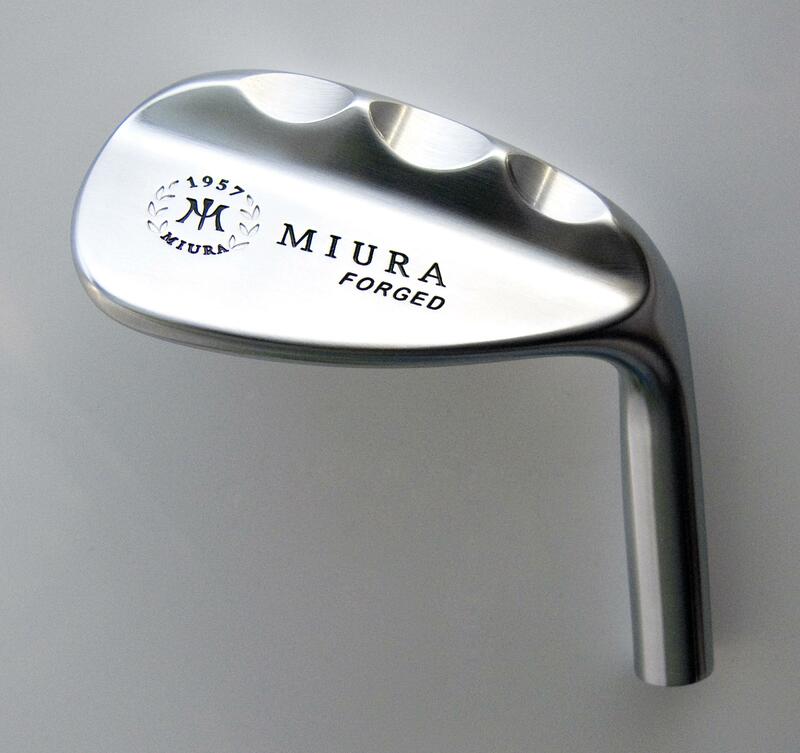 “Miura takes out that top layer with the impurities, and uses only the best low-carbon premium steel.” That’s what makes the metal dense and soft at the same time, and it’s why so many players use the word “butter” as an exclamation after hitting a Miura iron or wedge. Miura clubs are marketed only through customer club fitters. While the company isn’t well-known outside of the inside golf world, if you will, it’s a fact that a lot of players besides K.J. Choi are using them, albeit stamped with another company’s logo. Players who are looking for the best, Mr. Miura often says, will find him. The same is true for a great club fitter. Butler, in fact, is increasingly making his operation larger and more sophisticated. He now rents two spaces in the same Princeton by the Sea shopping mall, one devoted to research and development and the other to assembling clubs and selling Miura gear retail. For now, in fact, Butler has the only retail Miura operation in the world, and brings in Teaching Pro Tracy Nichols three days a week, to help swings get closer in quality to the clubs. Another friend who plays Miura that are assembled by Butler, Wayne Freedman, predicted that hitting one custom-made for me would be like my first taste of chocolate, yet another food metaphor. But that’s actually how I feel about my favorite club in the set, the K wedge, which comes only in a 56-degree version. The 56 degree K Wedge. While Miura offers several different models and grins in the wedges – – and the so-called Y wedges in 51 and 60 degrees perform as well as any brand I’ve ever use – – the K is decidedly different in look. It’s sole is fluted, appearing as if three finger-tips or knuckles have made an impression. The channels ostensibly reduce resistance against the wedge in wet sand and thick rough, reducing the chance of catching the ball heavy. As with the Baby Blades the balance on the K wedge is perfect, leading to effortless swings near the green and over the past three rounds, and an obviously growing number of gimmie one-puts – – thanks to the genius and technical expertise of Mr. Miura and Doctor Grip. Are you still playing these? Thoughts? ok great! I have a fitting next Tuesday where I will be trying out different Miura sticks! I’m pumped! I have hit the CB-501s before, and they felt like nothing I’ve ever hit. I will be hitting those again and the baby blades next week. Also, a few KZG offerings. I couldn’t find a date for this post, so I didn’t know if it was recently posted or not. Glad you liked them. Happy hitting. Which shafts did you get? For this set, True Temper M 80s, and David Butler recommended stiff. Am not sure the M 80s are still available. I now play Miura regular sized blades, with a regular flex shaft.